When Gordon Rimmer and his twin Steven started appearing in the Scottish ranking lists in the mid 1970’s with their club affiliation listed simply as ‘RAF’ very few knew very much about them: this was a state of affairs that would not last for long. They both represented Scotland and won medals with several successful Cambuslang Harriers teams and Gordon would go on to become a top flight steeplechaser who would be cruelly deprived of selection for the Olympic Games in 1980. If there is any doubt about his quality, look at his personal bests which have a range from 1500m to 10 miles. The two steeplechase times rank him 20th and 22nd on the British All-Time lists and the 3000m steeplechase time ranks him third in the Scottish All-Time list behind Tom Hanlon and Andrew Lemoncello although Lemoncello is the only one to have won a AAA’s title. He ran in two world cross-country championships for Scotland and won national steeplechase titles both north and south of the border as well as being in the RAF Athletics Association Hall of Fame. It is clear just from the figures that we have a very talented athlete in Gordon Rimmer. In the photograph above Steve and Gordon Rimmer tracking Steve Jones and Ray Crabb. Steve was about 18 months later in starting serious running than Gordon and tended not to do as much cross-country. He ran many more 800m and 1500m races and in his last year in the 1500 he got it down to 3:46. As boys in Irvine, they went to Irvine Royal Academy before the whole school moved to Ravenspark School, now renamed as Irvine Royal High School! The PE Department required that every male pupil would take part in the school boxing tournament. As their friend and schoolmate David Hall recalls, ” For most that meant getting in to the ring and lying down after a punch or two. For them it was ‘let’s both get to the final so that we can fight each other on finals night.’ Finals night was an evening event with boxing fans arriving from all over Ayrshire, many in full dinner-suit and dickie-bow. Gordon v Steven was the final in the first year but was staged as an exhibition thereafter – by public demand. They knocked seven bells out of each other. I don’t think they could have rigged the draw every year so that they met in the Final. Although Big Bill Cochrane the gym teacher would probably have introduced ‘seeding’ long before the concept was dreamt of at Wimbledon. They were the best of pals, though, and I seldom saw them having cross words with each other. Gordon’s athletic career is profiled below where, after a summary of the year, his own view of the season just past is added. This is followed by his own detailed replies to the questionnaire which are most informative. 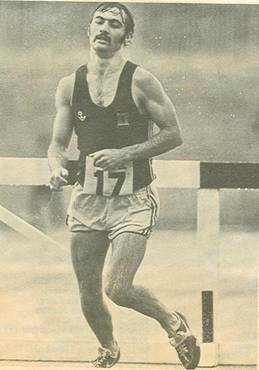 Born on 9th August 1956, he ran in the National Junior Cross Country Championships for his home town club of Irvine AC and finished 19th, one place in front of a young Charlie Haskett and four in front of future club-mate Eddie Stewart racing for West of Scotland Harriers. Competing as Cambuslang Harriers/ Royal Air Force in Scotland. His competitions however were mainly in England. (In fact in the course of his career he competed for Vale of Aylesbury, Newark AC, Holbeach AC and Thames Valley Harriers although Cambuslang is the club he represented longest and is most associated with.) On 19th June he was thirty ninth in the Rex Foulkes 20 km road race in Aylesbury in 67:39, on 4th September he ran in the Witney 12 mile road race in which he was thirty fourth in 68:52, on 29th September he was third in the RAF Benson Benson 7 miles road race in 35:52 and finally on 27th November he was twenty third in the Wolverton 5 miles road race. The following year, 1977, he really drew himself to the attention of the Scottish athletics public. In the course of the year he had wins at Banbury (cross-country), indoors at Cosford (8:31.0 for 3000m) and again over 3000 metres at Isleworth (8:27.6) with second places at Milton Keynes (Bucks Cross-Country Championships), Wantage (in the Grove 7 miles road race) and over 10,000 (29:54.4) metres at Crystal Palace in a Southern Counties Open Meeting. By the end of the year he was ranked seventh in Scotland for the 10000m, 26th for the 5000m (14:34.8), fourteenth in the 3000m (8:23.8) and twenty eighth in the 1500m with 3:57.2. Over the country he was nineteenth in the Scottish Junior Cross Country Championships at Glenrothes. 1978 was even better at all distances and his rankings at the end of the year were impressive. The range was wide. He ran several 3000m races indoor and out: at Cosford he raced 8:30.8 in the Southern Counties v the RAF v the Army in April where he won. He also won 3000m races for the RAF v Midland Counties, for the Combined Services v Southern Counties but his quickest time for the year at that distance was 7:59.7 when finishing sixteenth at Crystal Palace Grand Prix Meeting. There was a Two Miles in 8:55 at Crystal Palace in an IAC Invitation Meeting. There was also a whole series of 5000m races with good times in the Inter-Services at Portsmouth (second in 14:20), Notts Salute To Sport Meet in Harvey Haddon Stadium (fifth in 14:06.8), Cosford (second in the Royal Air Force Championships in 14:36.8) and in the Notts League Division 1 (14:37.8). And there was a result not generally noted that year – Jnr Tech G Rimmer was second in the RAF Championship Steeplechase in 9:40.2. Of course he ran on the road that summer with the 1977 RAF Henlow 10 Miles in which 341 finished he was second in 51:13. His best 10 mile time that year was at Whittlesey where he was third in 49:18. He was by now a regular in RAF representative teams – he turned out against Midland Counties and Universities Athletic Union, and against Eastern Counties and Cambridge University; fourth in the RAF Cross Cross-Country Championships and sixth in the Inter-Services Cross-Country Championships. Back in Scotland he was tenth in the West District Cross Country Championships at East Kilbride where with team mates Rod Stone, Bob Anderson, Peter Preston, Colin Donnelly and Gordon Eadie the team was fourth. In the In the November he ran his first Edinburgh to Glasgow for Cambuslang Harriers on the sixth stage where he maintained the club in fourth position. By the end of 1978 he was placed fourth in the 3000m rankings with his time of 7:59.7, seventh in the 5000m with 14:06.8 and seventeenth in the 1500m with 3:51.0. 1979 for Gordon Rimmer was a major step up in class from an already very good career. Starting with fifth place in a quality field at the Scottish National Cross Country Championship and selection for the international in Limerick he earned selections for Scotland and Great Britain on the track. The official SAAA Handbook written by John Keddie states: “1979 saw the appearance of a newcomer to steeplechasing in Gordon Rimmer (Cambuslang Harriers). His progress in the event was spectacular that year.” and his progress from 8:52.7 when winning the SAAA Championships in June via 8:44.2 in the AAA’s Championships in June to 8:39.2 when winning the UK closed, was detailed and it pointed out that the latter time was the second fastest ever by a Scot. He also won the RAF Steeplechase in 9:11.8 and on the same day was second in the 1500m in 3:52.2 (with brother Steven third in 3:53!) The year was so good for him in the event that it would be worth looking at it in detail after noting that he also raced a 2000m steeplechase in 5:34.21 at Gateshead at the end of the season in which he was second. While these results were the talking point, there was a lot more to Gordon Rimmer’s season than that. A Series of good 1500’s with a season’s best of 3:49.7, a 3000 m best of 8:06.0, Two Miles in 8:34.5, a whole host of 5000m times including a best of 13:51.1 when winning for the RAF against the South Netherlands a 14:44.9 when winning for Scotland against Greece and Wales in Cwmbran. There were also many first class road and cross country races . For instance in the Edinburgh to Glasgow, he again ran the long sixth stage and recorded the second fastest of the day when maintaining sixth place for his club. With such a season under his belt, and 1980 being Olympic year, he must have had selection in his sights. Running with the quality! 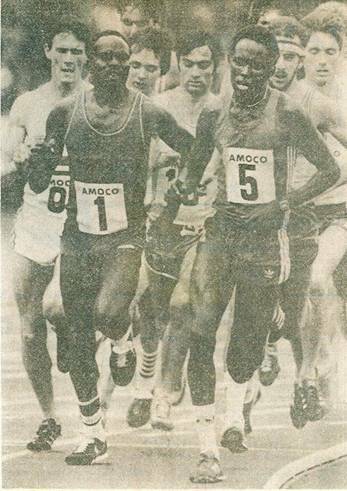 Steve Jones, Henry Rono, Gordon Rimmer, Filbert Bayi and Nat Muir in the Amoco International 3000 metres in 1980. 1980 started as had 1979 with a series of very successful races. He was second in the New Year’s Day race over 4.5 miles on the road at Beith and then on the first Saturday in the New Year he won the prestigious Nigel Barge Road Race by only two seconds from that famous fast finisher, Jim Dingwall. On the country, he led the RAF to its victory in the Sir Sefton Brancker Trophy against the Civil Service and Middlesex teams. And at Cosford on 26th January he ran 8:05.0 for the indoor 3000m. Excellent running on road, cross-country and indoor track – 4 races, all in January. On 2nd February, he was sixth in a very hard fought Scottish Cross Country Championships and won selection for the International to be held at Longchamps Race Course in Paris. He and his brother Steve had led the Cambuslang team in the Scottish Championships to third place. The team, which included Rod Stone, Alex Gilmour, Eddie Stewart and Duncan McAuley, won the club its first ever SCCU medals. Four days after the Scottish Championships he ran in the RAF Championships at Halton where he was fifth and on the 29th February he was also fifth in the Inter-Services Cross Country Championships. Another month, another four races. The background for the summer was being well and truly built up. March and April were quiet months In May he ran his first 5000 metres of the season when he was second in 14:01.8 for Scotland against Northern Ireland. The first 1500m came five days later when his time in winning in Holland in the RAF v South Netherlands race was 3:45.7. In the Inter-Counties at Birmingham at the end of May he was third in 8:40.1 and at this point he was ready for an excellent racing season. On 4th June at the Louvain Invitation Meeting in Belgium he set what was to remain his lifetime best for the steeplechase: 8:26.6. Then on 14th June he was fourth in the first Heat in 8:58.8 and then in the Final the following afternoon, he had the most unlucky steeplechase race of his life. There are times when every steeplechaser hits a hurdle but to do it in an Olympic trial race – words can’t describe it! He hit a hurdle in the back straight rather heavily and then fell at the final hurdle to eventually finish fifth in 8:42.2. He had every reason to think that the selectors would look favourably on his chances given his form the of the previous year and then again this year, particularly in view of the Louvain time. He was clearly not a one fast time wonder of an athlete – he was a seasoned and consistent performer. The following weekend he ran in the SAAA Championships and won comfortably in 8:54.5. In July, on the ninth he ran 1500m in 3:46.4 in the Inter-Services Championships, 8:07.2 for the 3000m at the Amoco International at Crystal Palace and 8:47 for the steeplechase at the Bislett Games in Oslo. The excellent running – 8:26.6 for the ‘chase, 3:45.7 for 1500 and 14:01 for 5000 – was in vain: he had a bad race at the UK Championships and he was not selected for the Olympic Games. On 8th August in the International Athletes Club Invitational at Crystal Palace, he ran the steeplechase in 8:39.6: on 16th in the Edinburgh Invitation Games, he was out in the 5000m where he recorded 14:10.5; on 25th he was in the steeplechase at the British Meat Games (a good 8:37.9) and on the 31st he ran in the Scotland v England v Norway v Yugoslavia he was in the 300m where he was timed at 8:04.2. 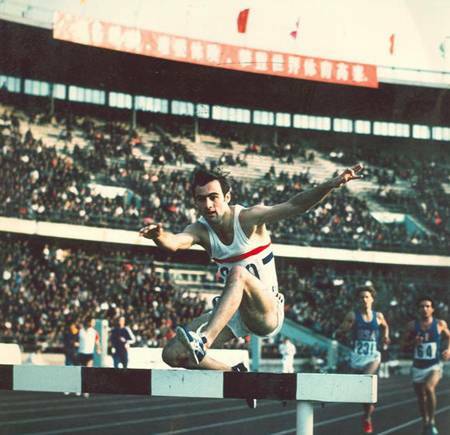 In September there were three top class steeplechases: on the 6th at the AAA Championships he was second in the steeplechase in 8:40.0; on the 20th at the Eight Nations Games in Tokyo he was 6th in 8:41.7 and then one week later he was second in Beijing in the Peking International in 8:33.7. What a way to finish the summer – second in the AAA’s, two international appearances, all in good times and a defiant shake of the fist at the selectors. Most runners would have taken a month or two off after such a summer, but that was not Gordon’s way. In October he travelled to Inverness with Cambuslang for the Scottish Four Man Cross Country Relays where along with Irish Internationalist Rod Stone and Scottish representatives Alex Gilmour and Eddie Stewart he was part of the winning team and in the Edinburgh to Glasgow in November he helped the team to second place and their first ever medal when he ran the sixth stage again and pulled the team from sixth to second with the fastest time on the stage. (Incidentally after the team had dropped to fourth on the seventh stage, it was brother Steve who pulled them back up to second on the final leg.) November ended with a win in the Wolverton 5 Miles Road Race on the 29th and the RAF account of it says: “The 1980 race was a tremendous contest between International steeplechasers Roger Hackney and Gordon Rimmer with Rimmer getting the edge in 23:08.” This was a new course record, the previous one (23;20) having been set by Ron Grove in 1969. Given that Hackney had been selected for the Games and (despite being faster) Gordon hadn’t, it must have been a sweet victory. His reprise of the wonderful year: “How was I going to follow the successes of1979 in 1980? It was a good start with a win in the Nigel Barge Road Race, and I then went on a winter training weekend for steeplechasers to Lilleshall and on the same weekend, down the road at RAF Cosford it was the AAA’s Indoor Championships. So I entered on the day and finished fifth in the 3000m in 8:05 despite no specific training. A week later I finished sixth in the Scottish Cross-Country Championships in my home town of Irvine behind Nat Muir, John Robson and Allister Hutton and selected for the IAAF World Championships in Paris. Four days later I finished fifth in the RAF Championships again highlighting how strong the RAF were. I also finished fifth in the Inter-Services Championships behind Jones, Crabb, Wild and Hackney of the RAF. I couldn’t believe it when I went straight into the first RAF athletics match in April and opened up with a pb and RAF record winning the 1500m in 3:46.8. I again teamed up with brother Steve in the Scottish team against Northern Ireland and Luxemburg in a wind-swept Meadowbank Stadium. I was beaten in the 5000m in a photo-finish with the same time as Nat Muir (14:01.8). I then went on to the annual tour to Holland with the RAF and broke my own pb and RAF record again winning the 1500m in 3:45.7. I then started my steeplechase programme for the season finishing third in the Inter-Counties in a near-pb of 8:40. I was invited to the Ivo Van Damme invitation in Belgium to run the steeplechase with Dennis Coates and John Davies. The afternoon before the race Nat Muir, Mick McLeod and us three steeplechasers went for a two mile warm up jog and got lost, ending up doing nearly eight miles before we found the house we were staying at. Well, that warm up worked – I won the race in a sprint finish from the Belgian champ in a huge pb of 8:26.6. (A new Scottish record and 6th on the UK all-time list.) Thirty one years later it is still third on the Scottish all-time list and 21st on the UK all-time list. The next goal was the UK Championships and Olympic trials. After qualifying on the Friday night I thought I was up for the Final where in quite a fast race at the bell, Roger Hackney and I were 20 yards clear but on the back straight I lost concentration and rapped the barrier. With 200 metres to go Staynings overtook me and I panicked and sprinted too soon. I came to the last barrier still in third but my legs collapsed as I tried to hurdle it and I fell over it. I eventually picked myself up and trailed in in fifth having taken 79 seconds for the last lap to Staynings 61. What was so disappointing was I still had the fastest time but didn’t get picked for the Olympics in Moscow. Staynings, Hackney and Reitz went and none of them ran as fast as my 8:26.6 even when they got there. I won my second Scottish steeplechase title at Meadowbank in a modest time of 8:54. I ran 3:46.4 in the Inter-Services 1500m and a good 8:37 to finish second in a 3000m steeplechase in an invitational race at Crystal Palace behind Olympic medallist Maminski of Poland. I ran quite a few more ‘chases under 8:40 including second in the AAA’s beating an out of shape Henry Rono. These races got me picked for GB in the Eight Nations Games in Tokyo, a small consolation for not making the Olympics. In Tokyo I finished sixth in 8:41 but went on to Peking and improved to second in the good time of 8:33.7. I came back from the end of a long track season with a buzz and anchored RAF Cranwell to victory in the RAF Road Relay Championships starting over a minute behind British Fell Champion John Wild and going on to win by nearly a minute. However the thrill of the season was to anchor Cambuslang to their first ever team gold medal at the Scottish Cross-Country Relays up in Inverness. It was a close race all the way between Cambuslang and Clyde Valley. I took over dead level with Ron McDonald of Clyde Valley, I had no idea who he was, I just knew I felt great and no one was going to pass me. All the Cambuslang runners were shouting me on and telling me to keep going. I didn’t know he was a good finisher but anyway he didn’t know how good my finish was as I sped away up the last hill to win the title for Cambuslang and post the fastest time of the day. The following month, brother Steve and I travelled back to the homeland to run in the Edinburgh to Glasgow Relay for the unfancied Cambuslang. I took over on the long sixth leg and passed a few people and made huge inroads into John Graham’s (Clyde Valley’s) lead to post the fastest time of the day for the lap and gaining the silver medal for the first time for Cambuslang Harriers. Two weeks later I ran in the Wolverton 5 Mile Road race which I had run in the last four years, improving every year. Well, not only did I go and win it this year beating fellow steeplechaser Roger Hackney, Nick Lees and Tony Simmons but I smashed the long standing course record in 23:08. The final race of the season for 1980 was the IAC Team Cross-Country event at Crystal Palace. I was representing the RAF against Scotland, Ireland, Wales and all the English regions and a few other national teams. The short fast course suited my style and I helped the RAF team win by a huge margin. Ethiopians took the first two places followed by RAF runners Julian Goater, Steve Jones, myself and Roger Hackney in sixth, John Wild in twelfth and brother Steve in twenty sixth closed in to easily take the team title. What a great year despite missing out on the Olympics. Gordon only had three races in 1981 – all in January. On the 10th he was third in the 1500m at the Phillips Cosford Indoor Games in 3:45.8. A day later he was fourth in the RAF Cross-Country Championships and at the end of the month (28th) he was third equal in the Sir Sefton Branker RAF v Civil Service and Middlesex teams match. This was down to serious injury and it was to be twenty months before he could compete again. He says, “I started 1981 winning the Beith New Year Road Race from Lawrie Spence. I was having niggly groin and Achilles pains. I was mixing speed work and endurance trying to combine the indoor and cross-country events. I started off with an excellent start to the indoors 1500m. After qualifying in the Heats on the Friday night, I took it on after a few slowish laps to be beaten in a sprint finish by Colin Reitz and Tim Redman. I was only 0.1 off my outdoor pb in 3:45.8 and also beat Ken Newton, Glen Grant and Steve Flint who all ran under four minutes for the outdoor mile. I finished fourth in the RAF Cross-Country two weeks later with my groin strain flaring up even more and that was my last race until almost two years later, November 1982. I also had to turn down a GB indoor vest after being offered a place against France at Cosford. Came 1983 and on 9th February he ran the RAF Cross-Country Championship at Halton where he was seventh, three days later in the Eastern Counties Cross Country Championships he won in a time of 47:40. The race was far from a cakewalk however and the Thetford and Watton times reported it as follows: “Driving snow and a biting wind did not stop Gordon Rimmer storming to victory in the Senior event. Over nine miles of mud-caked slush , Rimmer, of Holbeach AC, never looked in any danger as the large field strung out behind him. He completed the course in 47 minutes 40 seconds – over a minute ahead of his nearest rival, Neil Thin of Cambridge University.” On 25th February, Gordon was fourth in the Inter-Services Cross-Country Championships. he won the Stanwick 10 miles in 49:06. Track started and on 4th May, running in a 3000m at Enfield for the RAF against Southern Counties and Wales, he turned in a time of 8:08.8 to be third and on 18th May he went one better to be second in the 3000m at Loughborough in 7:57.8 when the RAF took on Midland Counties and Loughborough University. Gordon returned to Scotland on 18th June when he was second in the SAAA 5000m in 14:01.8 and on the 25th at Chalfont St Peter he won the local Carnival Road Race in 27:41. On 3rd July at the Dewhirst Invitation Games at Spalding in the 300m he won in 8:05.7 and on 13th July at Cosford there was a win in the Inter-Services Championships 1500m in 3:46.9. On the track at Haringey in London on 7th August Gordon was first in the 5000m in the BAL Semi Final in a time of 14:08.1; on 13th August he won a 5000m in the British League in 14:11.5 , ending the month with a victory in the Bracknell 5 in 23:47. The results were good – 8 victories, two second places, a third and a fourth from 13 races; the times were good – 3:46, 7:57.8, 14:01 and 23:47 for 5 Miles. The 3000m was to be a personal best. Unfortunately he was so plagued by injury that he had to stop running seriously at that point when, at 27, he should have been at his peak. How Did You Get Involved In The Sport? I never ever trained or had any interest in running whilst at school, my mother did not want Steve (my twin brother) and I playing around the housing estate while our parents were at work, so we used to go to the playing fields in Irvine to play football most weekends and holidays. We used to leave it to the last minute to go home for tea and ended up running the mile plus to get home as fast as we could. The first time I “raced” was secondary school, Ravenspark Academy, cross-country races where I came second. School friend David Hall tried to get me to join his running club but I wasn’t interested. I joined Irvine ATC cadets and tried most sports, getting in the Scottish ATC Boxing team and had trials for the Scottish rugby team at scrum half. Irvine entered a team for the Ayrshire ATC Cross-Country Championships where I came sixth and was picked to represent the county in the Scottish ATC Championships. On no training I finished fifth in the Scottish at Arthur’s Seat in Edinburgh and was picked to represent Scotland in the British Championships. I came nowhere but was part of the winning Scottish team. I then joined the RAF the following year (1974) aged 17 and started a three year apprenticeship at RAF Halton in Buckinghamshire. I tried to get into the Unit football team but wasn’t good enough. My Flight Commander was in charge of the Cross-Country team and he persuaded me to have a go in the London Services Cross Country League. I remember running my first race on a very muddy hilly course at High Wycombe wearing my service issue white plimsolls and finished twentieth crawling up the last hill on all fours. My Flight Commander told me that was really good, so I continued racing in the league matches without doing any training. In 1975 I started boxing training and won the RAF Under 19 Championship and when I tried my first Cross-Country race at the end of the year I had a dramatic improvement and finished in the top three in most races. 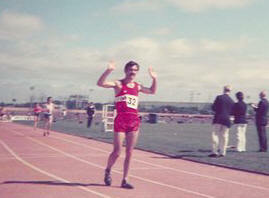 I joined Vale of Aylesbury AAC in 1976 and that’s where my athletics career began. Aylesbury were a big road running club and I competed mostly in road races, especially 10 milers. Did You Ever Have a Coach? I never had what you call a proper coach. A guy called Bob Wallis who was an RAF runner who wrote some schedules for Steve Jones early in his career also wrote some for me. Then Alan Warner, the RAF team manager took over – again just writing schedules, not really advising me. That was probably part of my downfall and made me injury prone as I think I raced far too much without much planning. What Do You Get Out Of The Sport? With the hard training and racing it certainly made me extremely disciplined and hugely competitive, along with a very good team spirit, attributes which I was able to transfer to make my professional and personal life so much more successful. I met a tremendous amount of runners who became friends, many of whom I still keep in touch with. I was able to visit many countries which I would never have done otherwise. It has also left me with many nice memories to look back on, and a scrap book to show my children and grandchildren hopefully. Can You Describe Your General Attitude To The Sport? When I took up the sport it was a recreational hobby which developed into a serious pastime where I had lots of fun. It would have been nice if the prize money and appearance money had been around in my time but that’s just life. I never had any specific diet and regularly ate junk food. Steve and I were called the Tupper Twins (after the comic hero runner Alf Tupper) as on the way to the Inter-Services Cross Country Championships when the team bus stopped for a ‘snack’ all the other runners were having a cup of tea and a teacake, Steve and I would order sausage, beans and chips just a couple of hours before the race. We certainly always had a few drinks the night before races, whether it was the Inter-Services or the Scottish Cross-Country Relays! Goodness knows how good I could have been if I hadn’t drunk so much and had a nutritionist, physiotherapist, coach and agent. I am disappointed with the quality and lack of depth within the sport both in Scotland and the UK and would love to be part of a programme to promote running to the younger generation. Has Any Individual Or Group Had a Marked Effect On Either Your Attitude To The Sport Or To Your Performance? Bob Wallis, an RAF runner and early mentor to Steve Jones gave me my first planned training sessions and later on Alan Warner, the RAF team manager, took over “coaching” me through the postal system. Early inspiration from watching telly was Lasse Viren, Ian Stewart and Brendan Foster. When I started running at a higher level Steve Ovett was not only an inspiration but would always say hello to everyone, even at just a Southern Counties v RAF match at Crystal Palace. He even shouted me on in the steeplechase in Oslo when he was there to run the mile, a true sportsman and gentleman. The RAF squad obviously had a great influence. At any other time my performances would have made me hero in the RAF but I was made to look “ordinary” when I first got into the squad with it full of internationals: Steve Jones (World marathon record holder, GB steeplechaser, 5000m and 10000m internationalist), Julian Goater (English National Cross-Country runner and GB 10000m runner), John Wild (English Cross-Country runner and steeplechaser, British Fell Champion), Ray Crabb (English Cross-Country and road runner, 2:13 marathoner), Roger Hackney (GB steeplechaser). It certainly provided motivation just to make the RAF team. One year I finished higher up in the Scottish Championships than I did in the RAF Championships! However they were all a great bunch of lads and we had many great tours and many great social nights. Newark Athletic Club were very helpful in our initial progression from club to international athletes and Steve and I had many enjoyable track sessions and Midland League races with them as we were improving our pb’s. Dave Cooney of Cambuslang inviting me into their team gave me great opportunities to come back to Scotland for championship races an particularly in the road and cross-country races which I enjoyed immensely. I remember one year my sister came to watch the Edinburgh to Glasgow relay and followed the race round in the Cambuslang team bus. Dave and the Cambuslang team were always so friendly and welcoming and what a fantastic team spirit, equal to if not better than the RAF squad. I still keep in touch and went along to Sutton Park this year (2011) to shout them on winning the British Masters road relay gold medal. They have also made Steve and I life members of the club. Speaking of Steve, my training partner and life-long competitive twin brother, we certainly drove each other on to better performances and I think made an even stronger bond between us than any other brothers. Being so competitive made us do pb’s even in training! 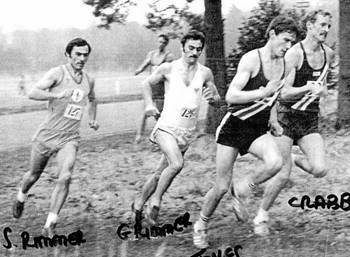 The most pleasing performance was anchoring Cambuslang to their first Scottish title in winning the Cross-Country relay championships in Inverness in 1980 after the three other runners Rod Stone, Eddie Stewart and Alex Gilmour putting me in neck and neck with Ron McDonald of Clyde Valley on the last leg and going on to lift the title for them gave me such a fantastic feeling when we beat the favourites, Clyde Valley. But the obvious best performance was my lifetime pb of 8:26.6 for the 3000m steeplechase in Belgium in 1980, a new Scottish record and sixth on the UK All-Time list at the time, and Nat Muir was cheering me on. Nat told me later as the Belgian champ passed me with 100m to go, Mike McLeod said to him “Looks like your Mate’s lost it.” Nat said “Don’t worry, I’ve seen his sprint finish,” and yes, I passed him with a few metres to go. What Do You Consider Your Worst Performance? 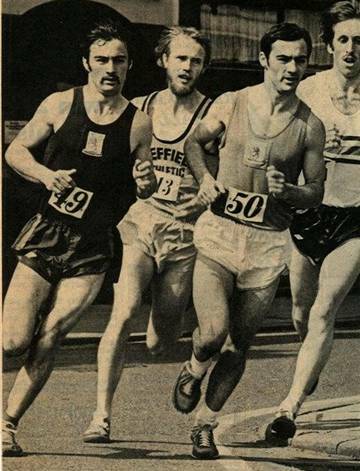 It may not have been my slowest race, 8:42.2, for the 300m steeplechase but it was the UK Championships/Olympic Trials at Crystal Palace in 1980. Two weeks after setting my top time in the UK (8:26.6) I felt confident that I would get in the top three and qualify for the Moscow Olympics. At the bell, Roger Hackney and I were 30 yards clear but I had a horrific last lap rapping one barrier after losing concentration and then falling over at the last to finish fifth. The first three went to Moscow but none of them ran as fast as my time even when they got to the Olympics. One other performance I remember that hurt was the RAF 1500m championships in 1980. I had never won that title and I was in great form and new I could outsprint any of them – Jones, Goater or Hackney. On the second lap we were still bunched with Jones leading, I was second with junior Mark Flint in third and Hackney fourth. All of a sudden I went tumbling to the ground, Hackney had pushed Flint who then caught my training leg. I picked myself up but finished fourth with Jones winning. The RAF picked me ahead of Hackney to team up with Jones in the Inter-Services, and I showed my form winning the title beating Jones, Glen Grant from the Army and Chris Robison from the Navy. What Do You Do Apart From Running To Relax? I am a family man and love going for walks in the country with Gill my wife and our little Yorkshire Terrier George. I watch lots of sports on telly and keep abreast of athletics with many websites – SATS, Power of 10, etc. I tried to make a comeback every year when I was 40 and 45 as it was a new Vet year, although I always gained speed quite quickly it never lasted long, either knee, calf or Achilles always flared up and cut any hopes I had of a comeback. I have been a golf fanatic for many years and still remain very competitive, having won quite a few competitions, particularly one-to-one match play competitions. I am 55 this year and having put on quite a few pounds, I realised that my knees in particular wouldn’t let me even jog to lose weight, so I have taken up cycling to lose weight and keep fit. Who knows if I will take it up competitively but I really enjoy it. Were There Any Goals That You Did Not Achieve? It would have been an honour and great experience to run in the Olympics and also to be able to tell friends about it many years later. I think, due to injuries, I never reached my potential pb’s in 5000m and 1500m in particular. I achieved my pb for 3000m just a few weeks before injury forced my retirement, so I will never know how fast I could have gone. I really think I could have done the sub four minute mile after I had given up the steeplechase. As I said before, without nutritionists, coaches and agents and particularly physios I did well but could have done better. I particular, my warm-up was touching my toes twice before embarking on a hard training run. I took up steeplechasing because it was a weaker event, but found out that it was a really tough event and the constant jarring on landing over the barriers took its toll on my body, especially as I only had little legs and it felt like a high jump at speed every time I hurdled a barrier. So having a fitness advisor would have had a huge effect on my career, I’m sure. Having to give up at age 27 still achieving pb’s was indeed a cruel blow to end my short but successful career. I think I raced far too much: as well as results in my profile, I was running every Wednesday in cross-country league matches or RAF matches as well as racing virtually every weekend. What Has Running Brought You That You Would Not Have Wanted To Miss? The friendship and camaraderie of both team mates and opponents, the mutual respect for each other. The excitement of racing and the feeling of success when you win gives you such a rush, especially when you beat someone better or achieve a pb and in particular I loved a sprint finish, gliding past many a runner to win in a 1500m race. Can You Give Details Of Your Training? It’s such a long time ago but what I remember, I was never a big mileage man: 60 – 70 miles max. Monday: 5 miles easy lunchtime; 3 x 5 minutes hard [3 min recovery] evening. Tuesday: 5 miles easy lunchtime; 7 miles tempo run evening. Wednesday: RAF or League Cross-Country League race. Thursday: 5 miles easy lunchtime; 5 x 3 minutes hard [two minutes recovery] evening. Friday: 5 miles easy lunchtime; 7 miles tempo run if no race on Saturday. Saturday: Race or 7 miles hard. Sunday: 10 – 12 miles. Tuesday: 5 miles easy; 12 x 200m [200 metres jog recovery] or 6 x 400 metres. Wednesday: race or 7 miles tempo run. Friday: 5 miles easy; 7 miles hard if no race on Saturday. Saturday: Race or miles hard. What Changes Would You Like To See In The Sport? It’s nice to watch the Diamond League races with all the pace makers and athletes doing fantastic times and help them achieve pb’s. However I preferred competing in “races” (we had no pace makers in my day) so every race was different and you didn’t know who was going to do what and had to react to different challenges throughout the race. I agree with the fantastic prize money and appearance money as you have a relatively short career in athletics. In these days of computer games, etc, the strength in depth in athletics is very poor – particularly in UK athletics. I like the programmes like JogScotland and Run England just to get people off their backsides and do a bit of sport. The Parkruns are also very good once you have got people interested in jogging. It’s a shame the World Cross-Country Championships became a GB team as it was the highlight of some of the Scottish runners careers. I am coming to the end of my RAF career and would love to get involved with some sort of management or events organisation in athletics in Scotland or England as a second career. The questionnaire raises some very interesting questions, not the least of which is – if Gordon could do what he has done without medical/physiological backing and training advice, why can’t the present generation do better with all that assistance???? However, Gordon’s story is fascinating in its own right and I’d like to thank him for his help in preparing it. Copyright © 2019 SCOTTISH DISTANCE RUNNING HISTORY All Rights Reserved.